캐나다 교과과정에 맞게 제작된 수학교재로서 각 레벨별 수학의 기초에서 부터 중급까지 다양한 예제와 문제풀이로 구성되어 있습니다. 영어로 진행되므로 캐나다교과 과정의 수학과목에서 사용되는 다양한 수학용어와 문제풀이 접근법에 대한 설명을 영어로 배울 수 있으며 기존 갖고 있는 수학의 지식을 함께 연마할 수 있는 우수한 교재입니다. Thank you for MathSmart. I'am teaching him and he is enjoying it. Hope to hear from you soon on any other topics we can involve him in." 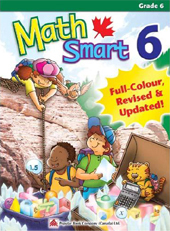 "These books are excellent as they cover exactly the 5 strands of the Math curriculum..."
"These are excellent MathSmart books. Good series. Congratulations." "I find the books to be wonderfully clean and clear, well organized, and with an abundance of tips and terms; they are presented in a simplified format that seeks to get the heart of the topic over to the student quickly. I have recommended this series to other members of staff and to parents and would not hesitate to recommend them to others."